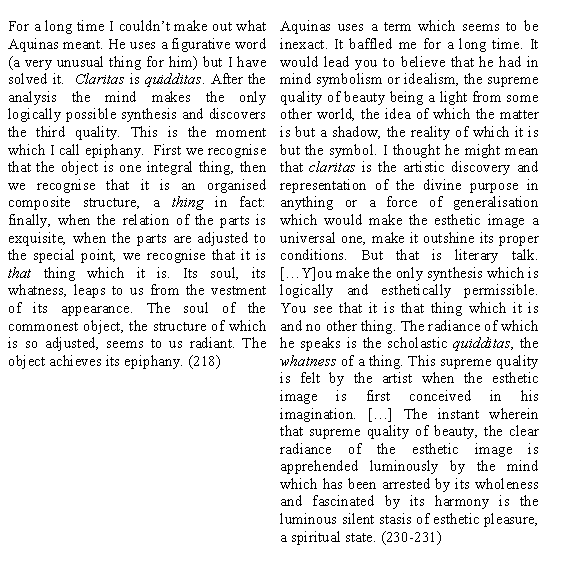 *(follows on from ‘from the epiphany to the esthetic image’, ‘a paean’, & ‘*on the ‘image’.—vs. Platonic ressentiment‘. …). *—toward the concept of a disruptive, anti-transcendental ‘classicism’. —an… amalgamation, of sorts, of all of the gone before…). —I suggested that the latter refines the terms of the former, bringing out (or rendering explicit) the—implicit—a-religious anti-metaphysics at stake within it, and incorporates the opposition of the ‘classical’ and ‘romantic’ artistic ‘tempers’ of Stephen’s ‘Art and Life’ paper in Stephen Hero (and in-of Joyce’s own early critical writing). This will allow me (I hope) to go at least some of the way toward clarifying and substantiating the (what Nietzsche, and, following him, Joyce and Hulme, characterise as problematic) relationship of the ‘romantic’, and of Romanticism, to the transcendental. *(—maintaining the capitalisation when referring to the artists and movement-period now, somewhat problematically it must be admitted, identified as Romantic, in distinction to the term’s use by Joyce, Nietzsche and Hulme, for which I’ll maintain the lower case and quotation marks here…). *… That is,—I’ll seek here, by way of introduction, to clarify what I’ve already (somewhat pre-emptively) called the rejection of ‘Platonic ressentiment’ in Stephen’s aesthetic theory, and, thus, to contextualise the philosophical stakes in-of the image and the ‘classical’ as I’m going to seek to lay these out here. *—‘Kant’s greatest merit is the distinction of the phenomenon and the thing-in-itself, based on the proof that between things and us always stands the intellect, and that on this account they cannot be known according to what they may be in themselves.’ (‘Appendix: Criticism of the Kantian Philosophy’ in Schopenhauer, WWR, I, 413-534 (417-418)). *—For Kant, all that can be known of an object is that which appears within the limits of the human intuition of space and time. *(—on this, see Jacquette, The Philosophy of Schopenhauer, 19). Space and time constitute the appearance’s form: allowing the manifold of appearance to be ordered according to certain relations. They are a priori: constituting the very condition of the possibility of the realm of appearance and sensible knowledge, but have no meaning if applied beyond it. —For Kant, the thing-in-itself is conditioned by neither space nor time. Our understanding cannot transcend the limits of sensibility and therefore we can attain no knowledge of things as they are in themselves. *(—Kant, Critique of Pure Reason, A 30/B 45. Cf. 85 A 45/B 62 (—on the ‘transcendental object’), and also A 128. And, again,—see Howard Caygill, A Kant Dictionary— esp. 79-80 and 393). *—That which is not an appearance cannot be an object of experience. *—For Kant, experience remains (and must remain) on this side of the transcendental. *In his division of the world into ‘will’ and ‘representation’, Schopenhauer retains Kant’s distinction of the thing-in-itself and the appearance. However, he refutes the method by which, he argues, Kant arrives at his deduction of the thing-in-itself. Kant refutes what he argues is ‘the absurd conclusion that there can be appearance without anything that appears’. *(Critique of Pure Reason, B 27). … —In the criticism of Kant which he appended to The World as Will and Representation, Schopenhauer accuses Kant of contradicting his own idealist distinction, by claiming that the thing-in-itself has an objective foundation,—independent of subjective representation. He argues that Kant reached his account of the thing-in-itself via an erroneous application of the law of causality: that empirical perception and, more fundamentally, sensation, from which the former arises, must have an external (that is, an objective) cause. Schopenhauer argues that the thing-in-itself lies on the side of the subjective. —The body is that of which the subject is most immediately aware. It represents, for Schopenhauer, the manifestation of the subject’s own ‘inner nature’ (—? h-mm. …), but is also, and at the same time, an object for-to the subject. As both subject and object, it thus constitutes (for Schopenhauer) the most immediate form of representation. —Through the body, Schopenhauer argues, the subject becomes aware of their ‘inner nature’: the force which precipitates their actions. *(—See Magee, The Philosophy of Schopenhauer, 137: ‘The movements of the material object which is my body are known to me not only through external sense, as are the movements of other material objects, but also directly, non-sensorily, non-intellectually from within, as acts of will’, and also Jacquette, The Philosophy of Schopenhauer,—73-74). As this precedes, and is the source of consciousness of the body and its actions, and therefore of the relationship of the subject and the object, for Schopenhauer it must thus exist prior to and outside of representation. This, he argues, allows him to extend his understanding of the ‘will’ (—as the motive ‘force’ underlying subjectivity), to all vegetable and animate life, as well as mineral development and phenomena such as electro-magnetism and gravitation,… —all of which he thus portrays as phenomenal expressions of a unified and universal (inchoate) striving ‘force’. —In contrast to Kant’s attempt to locate its foundation in objectivity, Schopenhauer extends his analysis of the subjective ‘will’ to the thing-in-itself. He argues that the willing of which the subject is conscious is the most immediate and adequate phenomenal expression of the noumenal. As such, he adopts the name of the subjective phenomena of the will in order to name the thing-in-itself. —He argues that, for Plato, the phenomenal realm represents the realm of becoming. *… —(In-)between, then, the phenomenon and the will, stands the Idea—‘as the only direct objectivity of the will.’ (Ibid.—and, again,—emphasis added here). *… —Art ‘repeats’ the Idea, apprehended through pure contemplation. *(and, again,… —for readings of Schopenhauer’s use of the Platonic Forms or Ideas and their place in his aesthetics, the reader is advised here to consult Julian Young, Schopenhauer, 77-78, 129-134, and Jacquette, ‘Introduction’ (8-9) and Paul Guyer, ‘Pleasure and Knowledge in Schopenhauer’s Aesthetics’, in Jacquette, ed., Schopenhauer, Philosophy, and the Arts (Cambridge: Cambridge University Press, 1996), 109-132 (109). *(—the a priori.—the very condition of the possibility of experience. …). *(—In ‘early Nietzsche vs. Schopenhauer’, I presented my reading of the terms of Nietzsche’s rejection of Schopenhauer, and what (the young) ol’ Fritz saw as the Schopenhauer’s attempt, in-and-through his conception of the ‘Will’ (—single, self-identical, metaphysical), to drape the thing-in-itself in the vestiture of the appearance(-representation). …). *That is. … —In (or for) Romanticism and, by extension, the ‘romantic’, as it will be cast in Joyce, Nietzsche, and Hulme,—artistic inspiration grants the artist a form of access to (or—beyond) the transcendental (—to the ‘Idea’) (—as I’ve Yeats, and this will be seen to be true, in the sequel, also of Shelley—as a sort of Romantic model (that is,—a model for the Romantic conception of artistic inspiration) here…). Following this genuinely radical insistence on the incompatibility of sensible presentation and the ideas of pure reason, on the impossibility of an adequate presentation of ideas, Kant’s successors in idealism and romanticism, albeit in quite distinct but ultimately related ways […] will reinvest the concept of presentation in such a way as to transform it into the kind of adequate and ever more perfect operation they perceive to be lacking in Kant. In the romantic theory of literature and art, what is perceived as both the dead end and the most formidable challenge of the Kantian of presentation is transformed into a model of art as the aesthetic activity of production and formation in which the absolute might be experienced and realized in an unmediated, immediate fashion […] a presentation of what in Kant remained unpresentable. *(—Phillipe Lacoue-Labarthe and Jean-Luc Nancy, The Literary Absolute: The Theory of Literature in German Romanticism, trans. Phillip Barnard and Cheryl Lester [Albany: State University of New York Press, 1988].—ix.). *… —‘ in which the *absolute might be experienced and realized in an unmediated, immediate fashion’. *(here: —under the rubric of Joyce’s/a ‘Joycean’ realism, Nietzsche’s conception of the structure of ressentiment, and Hulme’s rejection of a ‘Rousseauan’, Humanist politics in particular. …). … —Rejecting the (supposéd) exceeding of experience (—that experience has, as yet, indeed been something known,… —been known well enough (—an exhaustive knowledge-knowing),… —has indeed been something whole, controlled, and self-identical that it could be ‘exceeded’ …),—the exceeding of (the limits of) the transcendental *(—to the perfect, immutable, unchangeable Idea, if not so far as the thing-in-itself (=X)…). *—toward a disruptive, anti-transcendental ‘classicism’. *(follows on from *‘the fold in the self-creation of the artist’. …). *—the evolution of the aesthetic theory in Joyce’s writing. *(—see esp. … on *‘Intution, Flux, and anti-metaphysics’., & *‘the will to power’. …). The second is that the ‘epiphany’ can be used to name all and any of the structures of revelation at play in Joyce’s writing. *—I’ll argue that this material is reconfigured in Portrait to form, in particular, an implicit rejection of what I’ll call late-Romantic Platonic metaphysics, and, more specifically, of W.B. Yeats’s definition-coinage-formulation of *transcendental Symbolism. *—I’ll conclude my reading of Stephen Hero, Portrait and (in the light of)neo-classical Modernism by drawing a parallel between the anti-metaphysics in-of the ‘esthetic image’ and the terms of Nietzsche’s doctrine of the will to power, as I examined these in the first chapter-string-thread of fragments here *(and, again,—see *[links]). —I’ll argue that the both the (concept of the) image and the ‘classical’ in-of the aesthetic theory are refined again,—in(to) Stephen’s concept *—the ‘image of the artist’. *(That is,…)—It is a revelation. …*—A sudden(-suddenly) becoming visible, or sensible,—of something which had existed prior to the experience of its revelation, and yet which had remained (somehow) insensible, and only latent. *(—Walzl cites William F. Arndt and F. Wilbur Gingrich, A Greek-English Lexicon of the New Testament and Other Early Christian Literature (Chicago, 1957). *—The ‘epiphany’, then, is the becoming visible or sensible (—a form of becoming aware…) of something which had previously remained (for whatever reason or sets of reasons)—‘hidden’ (—obscured). …)…). Jim had always had a contempt for secrecy, and these notes were in the beginning ironical observations of slips, and little errors and gestures—mere straws in the wind—by which people betrayed the very things they were most careful to conceal. “Epiphanies” were always brief sketches, hardly ever more than some dozen lines in length, but always very accurately observed and noted, the matter being so slight. This collection served him as a sketchbook serves an artist. *(—Gogarty: …—‘So he recorded under “Epiphany” any showing forth by which one gave oneself away’. *[293-295]…). —This form of ‘manifestation’, rather than concerning a revelation through the quotidian, involves an ironic betrayal of the… —inward state (so to) of the observer. —Stephen defines the ‘phase of the mind’ as ‘memorable’ because, through the disruptive nature of the revelation, it is lifted beyond (—outwith) the continuum of quotidian experience. *… —In a move that will prove useful to my own reading of the original debate in the critical reception of the ‘epiphany’, I’m going to go ahead and make the claim (and why not? … —treat y’self, it’s nearly Christmas, etc. …) that Litz and Whittier-Ferguson make what I believe to be a misguided and fundamental critical error in reducing the artistic and critical significance of the ‘Epiphanies’ to autobiographical context. —Framed as an indirect address (admonishment.—the detail of the stick…), appealing to the mother, so that Mr Vance can administer discipline-punishment without violating the—unwritten-unspoken—social code, prohibiting disciplining someone else’s child (and thereby adopting the parental role and relegating the parent to the status of a by-stander. … *—an assumption of knowing better how to discipline another’s child… and it’s important, in this regard, that the fragment is framed at the outset in-through the domestic, social context of the parlour of the house…),—the mother thus made complicit in an open secret. *The striking element is the child’s burgeoning awareness-consciousness (—the revelation-manifestation)of the nature and stakes of this performance here… —Mr Vance’s appeal to, and reliance upon, the open secret, as well as the mother’s (necessary) voluntary complicity, in establishing (—performing)the authority to admonish and threaten retribution-punishment… *(—coupled to the child’s intimidation, resentment, and yet powerlessness in the face of the admonishment (—that is,—his inability to step outside the bounds of social and filial propriety implied by the performance, whilst painfully aware of the tenuousness and provisionality of its legitimacy)… *—‘under the table’. …). (and hence the dramatic use to which the fragment could then be put in Portrait, where, in fact, I’d argue (at least), very little is actually added (or—needs to be added) by way of exposition to expand the context, and where (in fact) it could be argued that the fragment is reduced, almost, to the status of a thematic precursor… (—?)). *(and Litz and Whittier-Ferguson rightly (in my opinion) argue that Joyce’s later prose (fiction) writing attains its ‘moments of highest achievement’ when these two forms are conjoined and made to comment upon and to ‘reinforce’ one another (each the other)… *[—158].). *—. By way of contextualising my own comparative reading of the presentations of Stephen’s aesthetic theory and interpretation of Aquinas in Stephen Hero and Portrait, I want to briefly revisit the terms of the debate waged over the use of the term ‘epiphany’ between Florence L. Walzl and Robert Scholes in the late nineteen sixties. On the one hand, Walzl argues that the ‘epiphany’ should be used as a critical tool in analysing Joyce’s works. She argues that the Dubliners stories represent ‘epiphanies’ and allusions to the liturgy of the Epiphany season, ironically inverting the nine manifestations of the Epiphany cycle. *(…—‘Jesus is revered as a babe by the Magi, marvelled at as a boy by the doctors on the Temple, blessed as a youth by the Holy Spirit at his baptism, and confirmed in the eyes of his disciples at Cana’.—Walzl, ‘The Liturgy of the Epiphany Season and the Epiphanies of Joyce’, 450.—See also ‘Symbolism in Joyce’s “Two Gallants”’, James Joyce Quarterly, 2 ,—73-81… ). *—See also Herbert M. McLuhan, ‘Joyce, Aquinas, and the Poetic Process’, Renascence: A Critical Journal of Letters, 4 (1951), 3-11 (repr. in Connolly, ed., Joyce’s Portrait, 249-265),—esp. 249-250, 253; Thomas E. Connolly, ‘Joyce’s Aesthetic Theory’, University of Kansas City Review, 23 (1956), 47-50 (repr. in Connolly, ed., Joyce’s Portrait, 266-271.—esp. 269-270…); Richard Ellmann, James Joyce : New and Revised Edition (New York/Oxford/Toronto: Oxford University Press, 1982 ), 83-84; Walzl, ‘The Liturgy of the Epiphany Season and the Epiphanies of Joyce’,—442, and (finally) Umberto Eco, The Middle Ages of Joyce: The Aesthetics of Chaosmos, trans. Ellen Esrock (London: Hutchinson Radius, 1989),—22-23. … ). *—In both texts, Stephen’s ostensible purpose is to interpret Aquinas’s definition of the conditions which it is necessary for a phenomenon to fulfil in order for it to be considered beautiful. —The first quality requisite for beauty is vaguely defined here as ‘integrity’,—suggestive of the persisting self-identity of the phenomenon. Stephen also defines it as ‘wholeness’ which suggests that the object does not lack any essential elements, that it is complete. *(—See Umberto Eco, The Aesthetics of Thomas Aquinas, trans. Hugh Bredin (London: Hutchinson Radius, 1988),—64, and Kevin O’Reilly, Aesthetic Perception: A Thomist Perspective (Dublin: Four Courts Press Ltd., 2007), *—esp. 18, 22. … ). (and this is relatively straightforward…). In Stephen Hero Stephen provides no specific context for his definition of beauty. —He refers to no specific type of experience, but to all sensible experience. —The ultimate aims, then, in Portrait,are to define both the ‘beautiful’, and the nature of the experience which forms the condition necessary for the creation of the work of art. *(—‘Joyce and Aquinas: The Theory of Aesthetics,’ Philological Quarterly, XXXVI, Jan., 1957, —repr. in Connolly, ed., Joyce’s Portrait,—272-289. —Consonantia is defined as the ‘due proportion’ both of the object itself and of its parts and thus the relationship of these parts to one another: their ‘harmony’. —Here, claritas means that for an object to be considered beautiful its colour and lustre must be bright, sharp and clean. Although Beebe is right to assert that the ‘translation’ Stephen offers is a simplified version of Aquinas’s original Latin, and that it omits the qualifying comments of the original text, he overlooks the dramatic context in which Stephen cites the text. *—That Joyce chose to offer this theorising in such a distilled form is for the benefit of the reader as much as it is for the benefit of Stephen in articulating his thoughts, and the benefit of Lynch as reluctant listener within the dramatic context of the exposition. *—A chance relation—a coincidence—brings the object into stark relief with its surroundings-environs,—foregrounding it and allowing the observer—for the first time—to become (in effect) *—defamiliarised with the object, and to (truly) see the object—as object. *—The ‘first quality of beauty’ constitutes, then,—the revelation of the object… *—its extraction from the invisibility that it was subject to in the complacency of quotidian apprehension. In both texts, Stephen dubs this phase of consonantia ‘Analysis’—the ‘analysis of apprehension’. *(—it’s only at this point—in his definition of the second phase of ‘artistic apprehension’ in Portrait—that he refers to the first phase as the ‘synthesis’ defined earlier in Stephen Hero…). —Whilst this reversal may indeed be more ‘Thomistically accurate’ (—according to Noon’s own definition (—? )), it doesn’t accord with Stephen’s definition of the process of artistic apprehension. *—According to Stephen’s interpretation, the object is first extracted from quotidian experience and is revealed for the first time to be one thing. —The object’s having been revealed as onething, distinct against the background or ‘void’ of all else in quotidian consciousness, allows, secondly, for the revelation of its properties and of their relationship to each other. For the first time the object is experienced as a thing,—a complex, organised and harmonious whole, comprised of its parts. *—In the synthesis of these two stages the parts of the object are adjusted in-within consciousness to reveal an uncommon completeness and high degree of perfection, previously repressed or overlooked in-within quotidian experience. *—‘we recognise that it is that thing which it is. Its soul, its whatness, leaps to us from the vestment of its appearance’. First, the object is extracted from quotidian experience and apprehended as ‘one thing’ (integritas). *—The object is now seen to be the result of the harmonious relationship of its parts (consonantia). *—The revelation of the object as one thing through the drawing of a boundary line extracting it from quotidian consciousness is now synthesised with the revelation of the object as a thing constituted by the harmonious proportion and relationship of its parts to which, for Stephen, this first revelation inevitably gave rise. *—‘You see that it is that thing which it is and no other thing’. *(—Cf. SH [—218]… *—‘it is that thing which it is’. …). *—recognition of the object (—as object), pulls-tears it from the oblivion of this complacency-assumed recognition. … *—defamiliarises (—in Shklovsky’s terms—‘estranges’) the object (—the observer from the object), and inaugurates a new seeing (—epistemology)… ). *(—a coincidence which initiates a new epistemological act… (—?). …). *(—Herbert Ellsworth Cory, The Significance of Beauty in Nature and Art [Milwaukee: Bruce Publishing Co, 1948], 227. Beebe, 285-286. *—For Beebe, following Cory, the meaning of claritas can be ascertained by reference to Aquinas’s account of how the glory of the redeemed human soul will radiate from its resurrected body at the end of history. —To do so reveals the ironic, subversive relationship of the aesthetic theory of Stephen Hero and Portrait to their (mutual) Thomist source. Noon argues that Aquinas employed the concepts of integritas, consonantia, and claritas to refer to existential qualities of the object rather than to moments or ‘phases’ of the (poet’s) psychological experience of the object. —If his objection to Stephen’s interpretation of quidditas is understood to rest on the conclusion that the interpretation of quidditas is purely psychological and precludes its application to the qualities of the object, then Noon can be shown to be mistaken. In Portrait the ‘“real” (or actual)’ and the ‘“rational (or notional)’ are fundamentally intertwined. ‘Artistic apprehension’ is an objective as well as a psychological process. *(—Stephen Hero… *—‘the object achieves its epiphany’. … —‘achieves its epiphany’… ). *Stephen’s proposed syntheses of claritas and quidditas in the revelation of the quiddity of the object in both Stephen Hero and Portrait are identical. … —This follows so hard upon the first reference to epiphany that in the space of a paragraph Stephen is transported suddenly through space and time south through the city from Eccles Street to the Ballast Office in order to expound his theory to Cranly. *(SH, 216.—On this, see Ian Crump,—‘Refining Himself out of Existence: The Evolution of Joyce’s Eesthetic Theory and the Drafts of Portrait’, in Cheng and Martin, eds., Joyce in Context [Cambridge: Cambridge University Press, 1992], 223-240 *[—233]… ). (—Sam Slote, ‘Epiphanic “Proteus”’, Genetic Joyce Studies, 5 , *[—accessed 10th March, 2014]… ). *Portrait is not, then, as Hugh Kenner argues, simply ‘drastically pruned’ of ‘key doctrines’ (—sic), such as the ‘epiphany’. —I’ll argue that this final stage represents the incorporation and refinement of the earlier opposition between the ‘classical’ and the ‘romantic’ artistic ‘tempers’, and privileging of the ‘classical’ in the ‘Art and Life’ paper in Stephen Hero. The (‘esthetic’) ‘image’ here, then, represents an attempt to forge a new trajectory for the legacy of Romanticism through a rejection of the aesthetics and metaphysics of late-Romanticism, in particular that of W.B. Yeats. *—I’ll argue that Stephen’s ironic appropriation of the terms of Romantic aesthetics and metaphysics lies at the heart of an attempt to forge an anti-Romantic ‘classical’ aesthetic. —A further eighteen are held in the Cornell University Joyce Collection (—see Robert Scholes, Florence L. Walzl, ‘The Epiphanies of Joyce,’ 152). —In 1965 Robert Scholes and Richard M. Kain reproduced all forty extant epiphanies, along with notes in Robert Scholes, Richard M. Kain, ed., The Workshop of Daedalus: James Joyce and the Raw Materials for Portrait of the Artist as a Young Man, (Evanston Illinois: Northwestern University Press, 1965), 11-51, and again with an introduction by A. Walton Litz, and John Whittier-Ferguson in James Joyce, Poems and Shorter Writings, ed. Richard Ellmann, A. Walton Litz, and John Whittier-Ferguson, (London: Faber and Faber, 1991), 155-200. *(hereafter: Shorter Writings—SW). Stanislaus Joyce, My Brother’s Keeper, ed. Richard Ellmann, ‘Preface’ by T.S. Eliot (London: Faber and Faber, 1982), 134-135 (see also, 144-145, 226-227, 231, 247, 251).—See also Scholes and Kain, The Workshop of Daedalus, 8-9. Robert Scholes and Florence L. Walzl, ‘The Epiphanies of Joyce’, PMLA, 82 (1967), 152-154 (152). See also, Scholes, Scholes, Robert, ‘Joyce and the Epiphany: The Key to the Labyrinth?’, Sewanee Review, 72 (1964), 65-77. repr. in Philip Brady and James F. Carens, eds., Critical Essays on James Joyce’s Portrait of the Artist as a Young Man. (London: Prentice Hall International, 1998) 27-35. On quidditas as ‘whatness’, see Eleonore Stump, Aquinas (London: Routledge, 2003), 261. —Stump argues that, for Aquinas, quiddity is linked to sense and the intellect. For Aquinas, according to Stump, quiddity means ‘that form of a thing that put it into one rather than another species or genus, its nature or essence.’ (Ibid.) Natures ‘do not exist in the world on their own; in the world they exist only as incorporated into the things that have natures’. (Ibid.) See also, 270-271. Eco quotes the passage from Portrait and argues that Stephen’s identification of claritas and quidditas is ‘felicitous’ (?) in its paying credence both to the interpretation of claritas as ‘the appearance of universal value embodied in the individual’ (—‘an organism signifies the universal which gives it life’), to the organism’s (the individual’s) signifying ‘itself, in its combination of universality with contingency, in the reality of its concrete form’, and to Eco’s own definition of quidditas as ‘substance’, to which I wish to return at the close of the current chapter-thread. … *—Cf. The Aesthetics of Thomas Aquinas, 120n (252-253).